This is the second post in the “You Asked For It” series and today I will discuss depth of field. What is depth of field and why should I care ? Depth of field is also the ability to have everything from close to infinity in sharp focus – greater depth of field. Whaaat ? How could the definition of depth of field mean two different things ? 1. The smaller the sensor on your camera the more difficult it will be to achieve shallow depth of field. This simply means if you have a compact point and shoot camera it will be very hard to take photographs with a shallow depth of field. The lenses on these cameras are simply not fast enough (the aperture does not open wide enough). There are of course some exceptions one being the Fujifilm X10 and X20 cameras which have very fast zoom lenses. 2. The wider the field of view (or the shorter the focal length) of the lens the more difficult it will be to achieve shallow depth of field (wide angle). The narrower the field of view (or the longer the focal length) the easier it will be to achieve shallow depth of field (telephoto). 3. Most kit lenses on DSLR cameras are not fast enough to achieve shallow depth of field. Now before everyone reading gets mad at me let me explain. Most of the time when you go out and buy a camera kit you are paying 80% of the price for the camera body and 20% for the lens. What does this mean ? The manufacturer is basically throwing in the lens to sweeten the deal and keep the price of the camera reasonable. Most of these kit cameras sold on the market today are also equipped with APS-C size sensors which are smaller than full frame sensors on professional cameras. There is nothing wrong with APS-C size sensors and they could be used for professional looking results but remember what I mentioned in the first comment (the smaller the sensor the more difficult it will be to achieve shallow depth of field). Anyway lets get back to the lenses. Most kit lenses supplied with cameras will be 18-55mm f/3.5-f/5.6 which simply means at 18mm the widest aperture you can use will be f/3.5 and it will slowly decrease as you zoom out to 55mm where the widest aperture available will be f/5.6. These are called sliding aperture lenses and are usually used on consumer level cameras. Professional level lenses will usually be fixed aperture lenses such as a 24-70mm f/2.8 lens. On this type of lens the widest aperture available will be f/2.8 throughout the entire zoom range which is a big difference from a kit lens. These lenses also carry a much higher price because they are more expensive to manufacture. There are some aftermarket fixed aperture zoom lenses available at reasonable prices such as the Tamron 17-50mm f/2.8 which also happens to be an excellent lens. 4. Full frame sensor cameras will be the easiest cameras to achieve shallow depth of field with. What is a full frame sensor ? The original format for a SLR camera (single lens reflex) was 35mm and that described the size of film it used which was approximately 36 x 24mm in size. When we say full frame DSLR (digital single lens reflex) we are referring to the size of the digital sensor which is approximately the size of a frame of 35mm film. As you can see in the diagram above your lens opening or aperture varies depending on what is required for correct exposure. The lens opening works in conjunction with the shutter speed on the camera. When your camera is in Program mode the camera decides the correct exposure by selecting a combination of shutter speed and aperture. In Program mode your camera decides everything so you have no control. The first thing you should do to be able to control depth of field is put your camera in Aperture Priority mode. By setting your camera to Aperture Priority mode you will control the lens opening or aperture and the camera will select the correct shutter speed to obtain correct exposure. Notice we are taking baby steps here and still working with a safety net. Your camera is still making decisions just not all of them. Now you will be able to control depth of field by selecting the lens opening of your choice. The first test I want you to do is to take a photo of a picket fence with a fully open aperture, then take the same photo with the aperture fully closed. Take the two photos from the position of standing right next to the fence and the pickets are moving away from you. Go ahead I’ll wait I’m retired 🙂 Now I want you to upload these images to your computer and compare them and see if you can tell the difference in depth of field. Which one was taken with the wide open aperture and which was taken with the fully closed aperture. Are you starting to understand the concept of depth of field ? So why do I care about shallow depth of field I want all my photos to be totally sharp ? OK if thats what you want you should close this article and move onto the next photo in the WordPress reader. But if I took the time to read this far into this post I would stick it out until the end. Sometimes we want to separate our subject from the background such as in a portrait. If you are taking a photo of someone standing in front of a Rhododendron that was blooming you would not want the flowers to be tack sharp because that would detract from your subject. You want your subject to be tack sharp and the flowers to be less sharp or blurred. That would be an example of shallow depth of field. By using a wide lens opening or a lower number (f-stop or aperture). A typical outdoor portrait with a pleasing background (soft focus) should be taken at an aperture of less than f/3.5 or a lower number. This is where the problem of the kit lens comes in because most of them do not go lower that f/3.5. Everyone who is serious about photography should purchase a 50mm f/1.8 lens or if your budget is a little more generous an f/1.4. Most manufacturers offer a 50mm f/1.8 lens for under $200 and the optics on a lenses such as these will probably be loads better than a kit lens. Yes but if I buy a 50mm I will lose the zoom function ? Well my answer to that would be use your feet to zoom, move back from the subject if you want a wider view or closer if you want a tighter view. Most people that buy 50mm lenses tend to use them a lot more than their kit zooms because of the increase in picture quality. 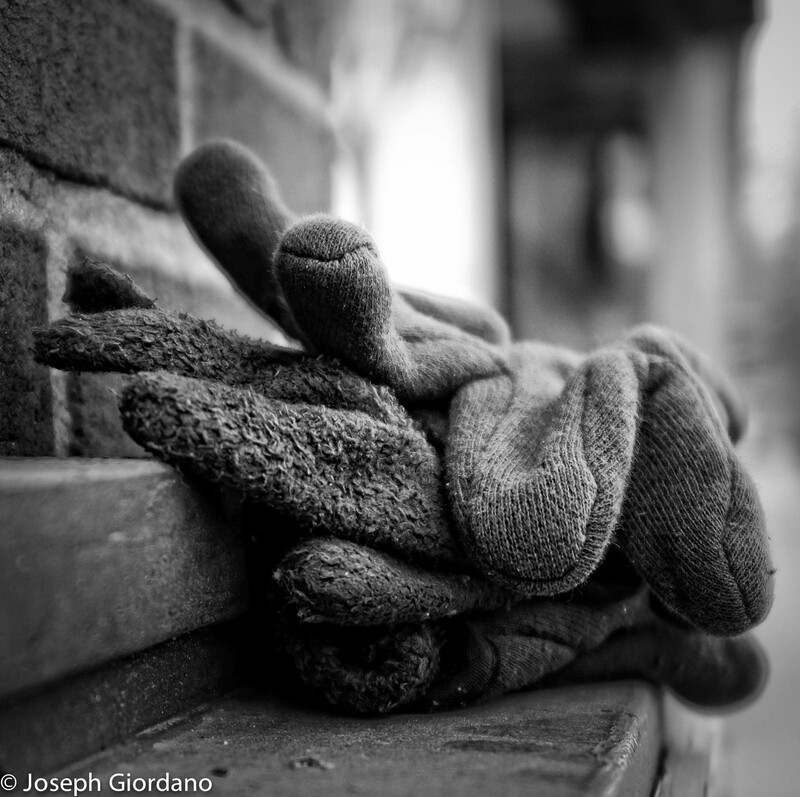 The photo below illustrates shallow depth of field where the fingertips of the gloves are in sharp focus but the background quicky falls off into a blur (a large lens opening or lower aperture number). This photo was taken with a Fuji X100s and the lens opening was f/2.0 the widest available on that camera. So far all I have been talking about is shallow depth of field. So why would I want greater depth of field ? If you are a person who likes to photograph landscapes you would want everything from near to far to be in focus. How would you do this ? By using a smaller lens opening or a higher number (f-stop or aperture). You can also achieve this effect by using a wider angle lens which inherently have greater depth of field. The photo below illustrates greater depth of field where everything from the rocks in the foreground to the bridge all the way in the distance is in sharp focus (a small lens opening or higher aperture number). This photo was taken with a Nikon D7000 and Tokina 12-24mm lens at f/8.0 which is about the middle of the aperture range for that lens. Be careful when using f-numbers or apertures smaller than f/8 or f/11 because an effect called diffraction will degrade your image quality (a whole different subject). Now for all of you with kit lenses out there whom I just alienated I apologize. There is still hope, just remember a wider lens opening will give you a shallow depth of field (a lower f-number), and a smaller lens opening (higher f-number) will give you a greater depth of field. Go out and experiment with your camera and kit lens. The reason I told you to put your camera in aperture priority mode earlier in this post is because I didn’t fully explain aperture and how it relates to shutter speed. I would rather you not get confused with formulas when you are still trying to grasp the concept of depth of field. The quicker you take your camera out of program mode or fully automatic mode the quicker you will take your images to the next level. I have a good friend who is a photographer, but when I asked him things about this and that on photography, I feel like I am an alien. Couldn’t understand him. Now I’ve found you. The tutorials are simple and easy to understand. Terms were explained better. Don’t feel bad, sometimes my wife looks at me with glazed eyes when she asks me a photography question Lyn 🙂 Thank you. Great post Joe! Very well written and extremely informative for anyone at any level. For me, I find going back to read this info as a re-fresher just helps to reinforce what I know and at times pick up little bits I may have forgotten. Thank you Mark 🙂 I am a little uncomfortable writing but I think the fact that so many people are happy with the posts motivates me to write more. Thank you for your comment. Great, post, Joe. I have a confession to make: I’m afraid of my camera. I’ve learned most of what I know through trial and error…or by dumb luck. I need to take some time to learn about the settings and not let it intimidate me. Thank you Alys 🙂 Most people I run across while I am taking photos say the same thing. In the manufacturers haste to add as many features as they possibly can they also make the cameras overcomplicated. Most of the time if you learn a little at a time it tends to stick with you. Have a great day. That makes me feel much better. I’ve read parts of the manual, only to come away even more confused. I generally use one of two settings and since 99% of my photos are outdoors and early in the day I manage ok. Still want to keep learning though. Thank you, Joe, for this wonderful post. >> Professional level lenses will usually be fixed aperture lenses such as a 24-70mm f/2.8 lens. Is this the same as Macro lens? Is there a fixed aperture lenses for F/11, I am just curious. First of all I am glad you enjoyed the post Helen 🙂 Last Friday was the start of this tutorial series and you can also access the latest posted tutorials on my site under the “Tutorial” menu. When I say fixed aperture lenses I really mean the largest aperture available at all zoom lengths, for example the 24-70 f/2.8 lens will remain at f/2.8 anywhere from 24mm all the way through 70mm. It will have other apertures available but it will remain fast at f2.8 if you choose to use it wide open. A consumer lens might be a 24-70mm but it might start at f/3.5 at 24mm then slide to f/5.6 wide open at 70mm. That is what I mean by a sliding aperture lens. A macro lens is something different and is used for close up photography. Joe, just for the sake of it, I went ahead and copied your blog post and copied it to Microsoft Word. Everything was copied flawless, even the pictures. The size were too big, but I resized them and they now look just fine. I also used the format where all the paragraphs have the same line length. I think Microsoft calls it “Justified Alignment”. If you wish I could attach this file and e-mail it to you so you could feel and taste of a potential e-book. It really feels like reading a real e-book book with text and graphics. I purchase all my English books from Amazon and read them in my iPad or Kindle. Prices are very reasonable and you can download a whole book in less then a minute. A blogger friend who lives in Panama wrote an e-book and published it in Amazon without much hassle. You have a good writing style, very simple and easy to understand, specially for newbies in photography, plus your photography skills are unquestioned. Furthermore, you have a loyal team of photographers who could cooperate with you in supplying sample photographs for your book. Please think about it. It could be as successful as your Monochrome Project which is outstanding as far as Black and White photographs are concerned. I’m fired up about your e-book in progress. Please let me know what you think. Hi Joe, I love this tutorial! This is an excellent feature to your blog and will inspire many new photographers to use their cameras in a more creative way. Thank You for sharing your knowledge! Thank you for enjoying it Gale 🙂 Have a great day. I knew you would have a surprise for us on Friday. And indeed it was a good one. Depth of field is a great concept and you did a good job in explaining it in lay terms, using nickle and dime wording. “The lenses on these cameras are simply not fast enough (the aperture does not open wide enough). There are of course some exceptions one being the Fujifilm X10 and X20 cameras which have very fast zoom lenses.” I guess now you can safely add the Fuji X30 camera to the list. (Omar smiles). Trish told me about the “nifty-fifty” and I purchased it at Amazon. It really does a great job in producing gorgeous bokehs with creamy soft backgrounds. In my opinion, everybody should have this inexpensive, yet very powerful lens; I mean the Canon EF 50mm f/1.8 II. It can be had for less than $100.00. One last comment Joe. Have you thought of binding your weekly tutorials and making a photography book for those looking for guidelines in simple terms easy to understand? I for one, would buy a book such as the one I’m describing as a reference when I forget valuable concepts. Since the blogs are already written, all you have to do is bind them and and the book is ready for the printing press. Think about it. Electronic books are now more popular than paper books— and cheaper too. Readers out there, what do you think? Thanks Joe for your well written photography tutorials and graphic samples. 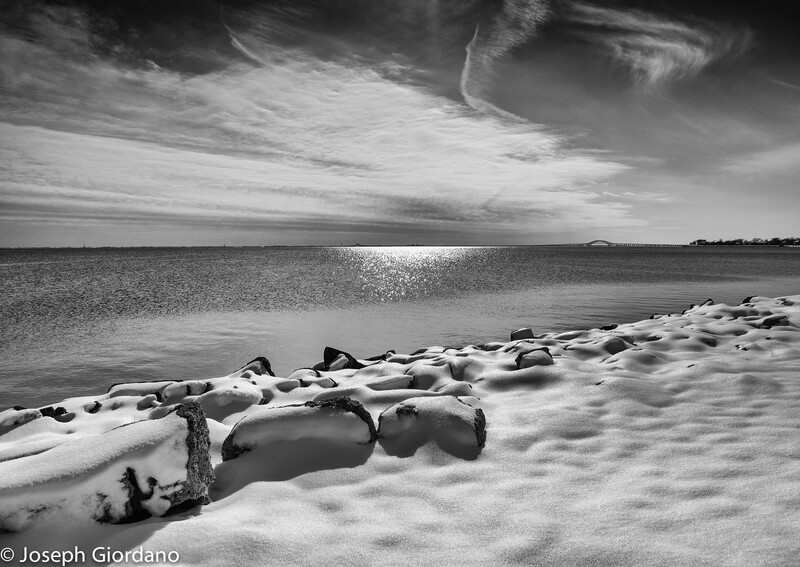 I always loved that B&W picture of the tranquil waters and the white ice. DOF was the first thing you ever taught me. Remember that? Your tutorial is great! I’ll have to read it a couple times to fully understand it though (clearly I’m not as smart as the previous commenters). I see numbers and my eyes glaze over (I did the same thing with chemistry in HS). I pretty much keep my camera on Aperture Priority, but mostly because I’ve never gotten beyond that chapter in the manual. Someday I’ll take time off and just learn the whole darn camera. I love this series, Joe! Thank you very much Laurie 🙂 When I was in school we had to make a pinhole camera out of an old Quaker Oats tube. I think the concept of aperture stuck with me because it was a simple hole in the side of the container with a hinged cover (that was the shutter) and a piece of sheet film in the tube. There was no lens, just that hole in the side and I was totally amazed at the results. Of course the teacher had a light meter to get the correct exposure for all of us or else we would have bankrupt Kodak guessing (well bankrupt them a lot sooner). Amazing work on this tutorial! No matter how long post you write you keep me focused till the end, you are really good at writing Joe! And, again, I haven’t seen depth of field explained so well before. A really great post Joe! I love the landscape photo! The Coffee Break one doesn’t work like Trish said. Thank you very much Elina 🙂 The coffee break photo should work now. I agree depth of field is very important and one of the first things people should learn. The “nifty fifty” lens is probably the best value in “photographers dollars” and it really helps when you want to achieve that dreamy out of focus look. As an added bonus for people with APS-C sensor cameras the 50mm doubles as a fast 75mm portrait lens with a 1.5x crop factor. Have a great day and I would appreciate if you can tell me if I fixed the problem with the coffee break photo. Thank you Trish 🙂 I fixed the coffee break photo, thanks for letting me know. Have a great day. Really helpful Joe – I think I just understood something for the first time! Thank you! Thank you Pauline 🙂 Trish mentioned the coffee break photo was not found but I fixed it. Have a great evening.